A popular fruit that grows on ground vines in a number of different shapes and sizes, all round and fairly large. 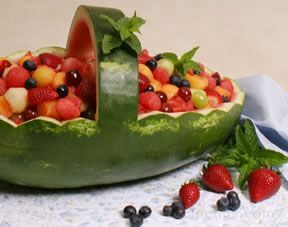 Watermelons can range in shape from round to elongated, weigh from 8 to 30 pounds and be filled with seeds or seedless. They have a thick rind that surrounds a range of flesh colors from pink to dark red and yellow. Some of the common types of melons are allsweet, crimson sweet, icebox, jubilee, seedless, and yellow flesh. 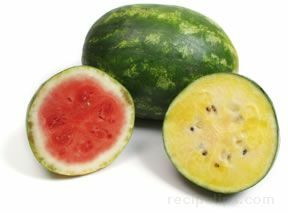 The icebox melon is round in shape, weighs from 5 to 15 pounds, and contains a red or yellow flesh. 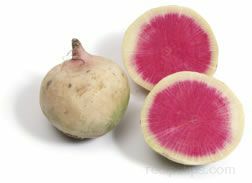 The jubilee and allsweet varieties are oval-shaped and elongated, larger in size (25 to 45 pounds), with flesh that can be pink to dark red. The Crimson sweets weigh between 15 to 35 pounds, have a shape that can be round or elongated, and have a flesh that can be either yellow or red. Yellow flesh melons generally weigh from 10 to 30 pounds, with a round or oval shape, and contain a bright yellow flesh that is not as sweet as the red-fleshed variety. 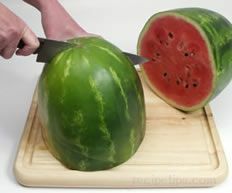 The seedless watermelons are very popular due to their lack of seeds. They range in size form 10 to 25 pounds and have a flesh color that can be either red or yellow. All watermelons consist of 80 to 90% water, they are low in calories, and contain an airy flesh that is very juicy and sweet to the taste. Watermelons originated in Africa and are now grown all over the world. There are hundreds of varieties and while it may be thought of as a fruit, it is actually a vegetable related to the cucumber family. Select watermelons that are firm, free of bruises, and heavy for their size. Ripe melons generally have a nice sheen to their outer skin and a yellow spot on their underside, which remains from where the melon grew on the ground. 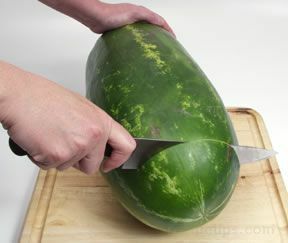 To ripen, keep uncut melons at room temperature. Cut melons should be stored in the refrigerator, wrapped with a plastic food wrap over the cut area that is exposed.